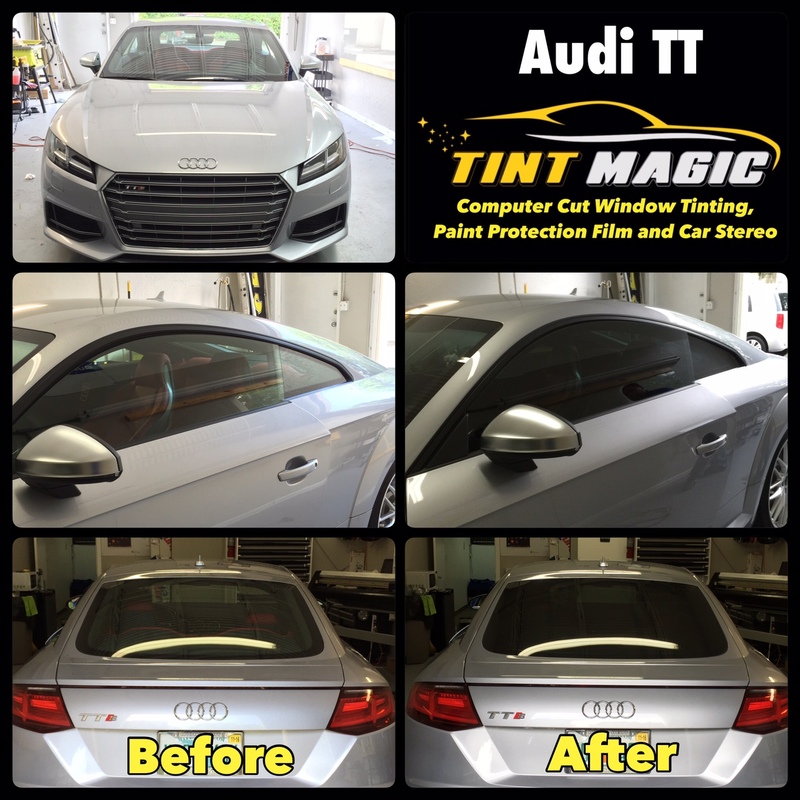 Audi TT at Tint Magic Window Tinting Coral Springs. We installed Nano Carbon 25% all over around for the best heat rejection, clarity and scratch resistance. Call us for a free estimate! (954)840-7883. Audi TT has never been a car for everyone. But now it’s tough to know if it’s a car for anyone. It’s in an existential crisis, a tiny high-style coupe adrift in an ocean of SUVs. And now, with the2016 TTs coupe, it has 292 horsepower with which to explore the boundaries of being and nothingness. Much of what turns the TT into a TTS is the same stuff that twists anA3 into an S3, or Volkswagen’s GTI into a Golf R. That includes the higher-performing ­version of the group’s turbocharged and direct-injected 2.0-liter iron-block four-cylinder. Running its own cylinder head, pistons, turbocharger, higher-pressure fuel-injection system, and other tweaks that separate it from more-plebeian versions, this four is beastly. But while the TTS engine’s 292 horsepower is 72 more than the 220 in the regular TT, its 280 pound-feet of peak torque is only a tame 22 pound-feet stronger than the base TT’s. And that torque peak comes later—1900 rpm instead of 1600—and runs out longer, to 5300 rpm instead of 4400. It takes merciless throttle usage to get maximum thrust from this engine. Feather-foot it and it’s just a base Golf rented at the Antwerp airport. A dual-clutch, six-speed automatic transmission (S tronic in Audi-speak) running closer ratios than in the regular TT is mandatory. The computerized shifting is impeccable, and it’s slick when shifted with the paddles, but it’s no manual gearbox. It’s inhumane that a more direct connection between the driver and his or her gears isn’t available in this car.